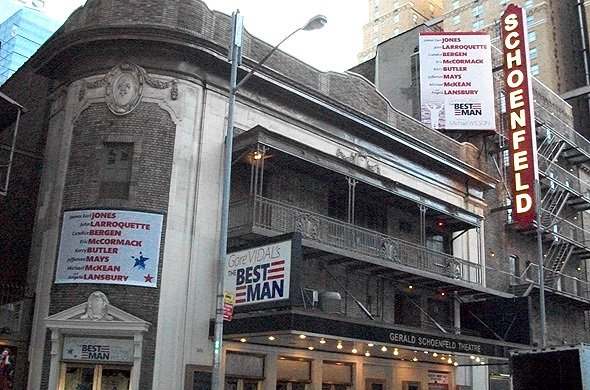 Even though it was the end of a very busy period at my day job and the eve of an out-of-town trip for which I hadn't yet packed, I couldn't resist catching the first preview of The Best Man on Broadway last Tuesday. I have not missed a first preview of any show Angela Lansbury has starred in since she returned to Broadway in Deuce in 2007 and I really didn't want to start now. I bought my last minute ticket at TKTS. The Best Man stars Angela Lansbury, James Earl Jones, John Larroquette, Candice Bergen, Eric McCormack, Kerry Butler, Jefferson Mays, Michael McKean, Dakin Matthews, Sherman Howard, Donna Hanover, Angelica Page, and Corey Brill. Gore Vidal's play, written in 1960 and set in 1960, is about two presidential candidates at the party convention, each vying for the nomination. The candidates are played by John Larroquette and Eric McCormack. James Earl Jones plays a former, extremely popular president, from whom they are both hoping to obtain an endorsement. Candice Beren and Kerry Butler play the potential first ladies. Michael McKean plays Larroquette's campaign manager while Jefferson Mays plays a former colleague of McCormack's. Angela Lansbury plays Mrs. Sue-Ellen Gamadge, an elderly southern lady who is the Chair of the Women's Division of the Party. The moment you walk into the Schoenfeld Theatre, you begin your time travel back to the 1960 convention. The theater has been transformed into the floor of a party convention and there are old tv sets and patriotic flags everywhere and a speech with cheers from a crowd are heard over the sound system. I felt my heart beat with patriotic pride just a little harder. The scenic design by Derek Mclane is absolutely fabulous, switching back and forth between two luxurous hotel suites and the stage of the convention arena. Ann Roth's costumes are fantastic too, especially for Kerry Butler, who plays the young wife of candidate McCormack, and Angela Lansbury. Angela's costumes are perfect for the woman of that certain age and station and add some hilarity to her already hiliarious portrayal of the Southern doyenne. The Best Man is over 50 years old, but unfortunately it is feels relevant. I was shockingly horrified to hear the dialogue about birth control, polital pandering, adultery, mental health and homosexuality. Even though it is a very funny play, the drama is riviting as are the twists and turns of events. Even though no party affiliation is ever mentioned, I found myself siding with candidate Russell, played by Larroquette. He is incredible in this performance. In fact, the entire cast is incredible and it is thrilling to see them playing. The only downside is that Angela Lansbury and James Earl Jones aren't in more scenes. At the first preview, during dialogue delivered by James Earl Jones, an audience member in the orchestra section suffered an attack. Somebody from the audience called out for a doctor and Mr. Jones responded by asking the stage manager to get one. The curtain came down promptly and we waited for approximately thirty minutes for the show to resume where it had left off. Its the stuff of live theatre and it was thrilling, even with the illness. With its three acts, it was a long evening but worth every minute. The producers say that this is a strictly limited 18 week engagement. Opening night is April 1st. After the show last Tuesday the 6th, I tweeted that I would be going to The Best Man again and often. It so happens that I'll be there tonight and I can't wait for the hilarity and drama all over again.